Monarch Air Group provides private air charter in Boulder, CO. Our clients benefit from top-notch service, unrelenting dedication to safety, wide selection of aircraft, and years of experience in chartering private jets. To obtain a free quote, please use our online quoting tool provided below, or call toll free 1-877-281-3051. Monarch Air Group provides private jet charter flights in and out of Boulder, Colorado, USA. Located at the foot of the Rocky Mountains, Boulder is a city in north central Colorado founded in 1859 and developed in the 1950s as a center of environmental and scientific studies. 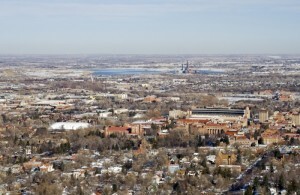 Being the Boulder County seat, Boulder possesses the University of Colorado, which has over 30,000 students. Being a regional employment center with about 86,000 jobs, Boulder plays a significant role in a wide range of industries, such as the federal research laboratories, university, local and regional retail, business services and high tech industry. Nowadays Boulder is a very beautiful town that blends outdoor adventure with urban, modern sophistication. There are plenty of year-round recreational activities like mountain biking, trail hiking, cruising on Boulder Creek Path and rock climbing. Historic downtown Boulder features unexpected entertainment on the Pearl Street Mall, and has many galleries, fashionable boutiques and pedestrian district’s unique sidewalk cafes. The Golden Gate Canyon State Park, the Eldorado Canyon State Park, the Eldora Mountain Resort, and the Rocky Mountain National Park are all within a short 20-to35-minute drive. Situated 35 miles northwest of Denver, Boulder is served by Boulder Municipal Airport(WBU) and by Denver International Airport(DEN), .